Houston’s historic third ward, aka “The Tre,” is ripe rife with history, and some of that history is digitally preserved and accessible through an art installation in the form of repurposed payphones. We love payphones for obvious reasons and seeing them alive and kicking warms our hearts. Packing them with local history checks even more boxes. Twenty-four people collaborated to rebuild the three phones which can be seen in the video after the break, including three visual artists, three ambassadors, and eighteen residents who put their efforts into making the phones relevant not only to the ward but specifically to the neighborhood. One phone plays sound clips from musicians who lived or still live in the ward, another phone has spoken word stories, and the third has field recordings from significant locations in The Tre. Each phone is powered by a solar cell and a USB battery pack connected to a Teensy with an audio adapter board, and a 20 watt amplifier. Buttons 1-9 play back recorded messages exclusive to each phone, star will record a message, and zero will play back the user-recorded message. Apps for smart phones are easy for young folks to figure out but the payphones ensure that these time capsules can be appreciated by people of any age, regardless of how tech savvy they are and that is wise as well as attractive. The coin return lever and coin slot also have associated sound clips unlike regular payphones so the artists get extra credit. Did we say that we love payphones? Yes, yes we did. The very first post on Hackday was for a redbox and that got the ball rolling. Late last year, artist [Steve Messam]’s project “Whistle” involved 16 steam engine whistles around Newcastle that would fire at different parts of the day over three months. The goal of the project was bring back the distinctive sound of the train whistles which used to be fixture of daily life, and to do so as authentically as possible. [Steve] has shared details on the construction and testing of the whistles, which as it turns out was a far more complex task than one might expect. The installation made use of modern technology like Raspberry Pi and cellular data networks, but when it came to manufacturing the whistles themselves the tried and true ways were best: casting in brass before machining on a lathe to finish. The original whistles are a peek into a different era. 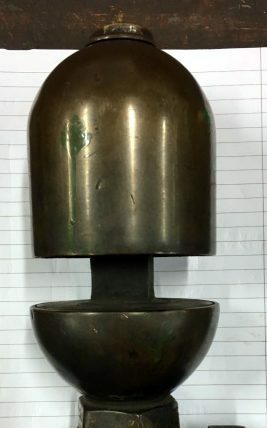 The bell type whistle has three major components: a large bell at the top, a cup at the base, and a central column through which steam is piped. These whistles were usually made by apprentices, as they required a range of engineering and manufacturing skills to produce correctly, but were not themselves a critical mechanical component. Embedded below is one such test. It’s slow-motion footage of what happens when the whistle fires after filling with rainwater. You may want to turn your speakers down for this one: locomotive whistles really were not known for their lack of volume. Tamiya’s Mini 4WD toy line primarily consists of small 1:32 scale toy cars powered by AA batteries, which have no remote control and are guided around a plastic track by horizontally oriented drive guide wheels. Tuning and racing these cars is popular in many parts of the world, but this build is a little different. After initial experiments with a modified Tamiya chassis are unsuccessful, a fresh build using a bespoke aluminium chassis is begun. A sturdy boiler is created, feeding into a piston which is used to drive all four wheels through a series of driveshafts. It’s interesting to watch the iterative design process solve various problems such as piston wear and gearing. Performance is underwhelming for those used to the immense speed of the electric toys, but we’d love to see a competition series using steam powered racers. We don’t see a whole lot of steam hacks around here, but the Hudspith steam bicycle is something to marvel at. Video after the break. Much to the chagrin of local historians, the city of Scranton, Pennsylvania is today best known as the setting for the American version of The Office. But while the exploits of Dunder Mifflin’s best and brightest might make for a good Netflix binge, there’s a lot more to the historic city than the fictional paper company. From its beginnings as a major supplier of anthracite coal to the introduction of America’s first electrically operated trolley system on its streets, Scranton earned its nickname “The Electric City” by being a major technological hub from the Industrial Revolution through to the Second World War. Today, the mines and furnaces of Scranton lie silent but not forgotten. In the 1980’s, the city started turning what remained of their industrial sites into historic landmarks and museums with the help of State and Federal grants. I recently got a chance to tour some of these locations, and came away very impressed. They’re an exceptional look into the early technology and processes which helped turn America into an industrial juggernaut. While no substitute for visiting these museums and parks for yourself, hopefully the following images and descriptions will give you an idea of what kind of attractions await visitors to the modern day Electric City. We got pointed by [packrat] to a 2015 presentation by [Dan Holohan] on the history and art of steam heating systems. At the advent of central heating systems for entire buildings, steam was used instead of water or air for the transport medium. These systems were installed in landmark buildings including the Empire State Building, which still use them to this day. A major advantage of steam-based heating system is that no pump is required: the steam will naturally rise up through the piping, condenses and returns to the origin. This can be implemented as a single pipe where condensation returns through the same pipe as the steam, or a two-pipe system where the condensate returns through its own pipe. In the presentation, Dan walks us through his experiences working on many of these steam heating systems in major US buildings, the types of systems, fixes implemented by engineers long since dead and the particularities of maintaining these systems. Now that we’re far enough into the next generation of home video game consoles that we can’t really keep calling them that anymore, yard sales are sure to be full of lonely Xbox 360s and PS3s that have been put out to pasture. You’ll probably even find a Wii U or two out there that somebody accidentally purchased. This is great for hackers who like cramming new electronics into outdated consumer gear, and accordingly, we’re starting to see the fruits of that generational shift. Case in point, this Xbox 360 which has been transformed into a “Steam Box” by [Pedro Mateus]. He figured the Xbox 360 was the proper size to fit a full PC plus PSU, while still looking contemporary enough that it won’t seem out of place in the entertainment center. Running SteamOS on Fedora 28, it even offers a traditional game console experience and user interface, despite the decidedly PC internals. On the outside, the only thing that really gives away this particular Xbox’s new lease on life (when the purple LEDs are off, anyway) is the laser cut acrylic Steam logo on the top that serves as a grill for the internal CPU cooler. Ironically, [Pedro] did spray the Xbox white instead of just starting with a black one, but otherwise, there wasn’t much external modification necessary. Inside, of course, is a very different story. It’s packing an AMD Ryzen 5 2400G processor with Radeon RX Vega 11GPU and 8GB of Corsair Vengeance LPX DDR4 3200MHz RAM. Power is provided by a Seasonic SS-300TFX 300W, and a Noctua NH-L9a-AM4 keeps the system cool. Even with all that gear in there, the thing is probably still quieter than the stock Xbox 360. 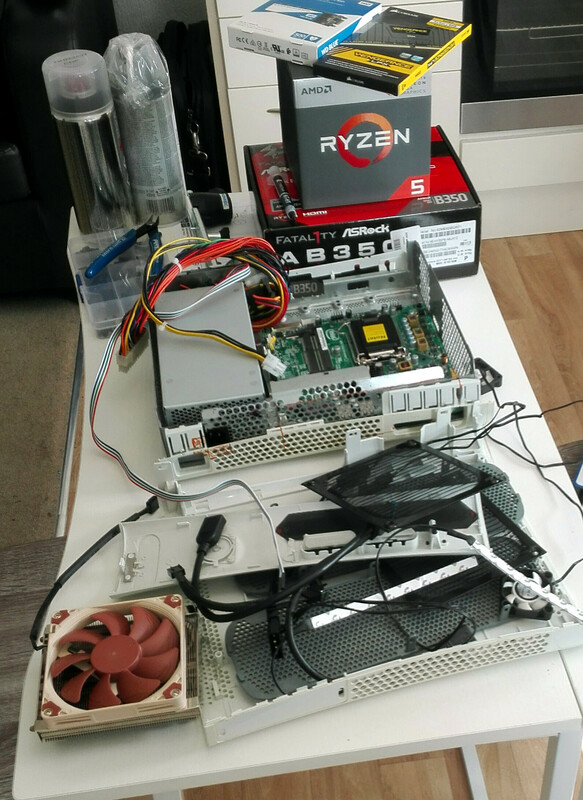 [Pedro] helpfully provides quite a few benchmarks for those wondering how this hacked-up Xbox fares against a more traditional gaming setup, though peak performance was obviously not the goal here. If you’ve got 45 minutes or so to spare, you should check out the video he’s put together after the break, which goes over the machine’s construction. We’ve seen it done with the original Xbox, and now the Xbox 360. Who will be the first to send in their build that guts a current-generation Xbox and turns it into a PC for Internet fame? Remember when computer mice didn’t have scroll wheels? The greatest mouse of all time, the Microsoft Intellimouse Explorer 3.0, is back in production. This mouse was released in 2003, before the popularity of ‘gaming’ mice from the likes of Razer, and at the time it was the standard mouse for RTS and FPS professional gamers. After producing a few million of these mice, the molds died or the sensors were out of stock, Microsoft stopped shipping the Intellimouse Explorer 3.0, and the ones that were out in the wild slowly died. Now this fantastic mouse is back, and it’s only going to set you back $40. Believe me when I say this is one of the greatest user interface devices ever created, right up there with the Model M keyboard. Another week, another update on building an airplane in a basement. [Peter Sripol] has basically finished the fuselage of his homebuilt ultralight with working elevator, rudder, and landing gear that looks like it might hold up. The Pebble was one of the most successful crowdfunding campaigns ever, and now it’s dead. Pebble was bought by Fitbit for $40M, and now the Pebble servers are off, as of June 30th. Of course there are community-based projects to keep the Pebble working, notably the rebble project. It’s time for Steam’s summer sale, and your wallet is crying. The standout deal is the Steam Link, a sort of ‘thin client for Steam’ that plugs into your TV, looks on the network for your battlestation, and allows you to play Fortnite or whatever on the big screen. The Steam Link normally sells for $50, but with the summer sale it’s two dollars and fifty cents. Here are a few experiments in CNC joinery. [Mirock] has a CNC machine and a few pieces of wood, and explored what is possible when you want to join two boards at ninety degrees to each other. Why is this interesting? One of the joints on this simple box project consists of a circle with a hole on one board, and a pin on the other. This is basically a Knapp joint, a ‘dovetail’ of sorts that was developed in the 1860s. This was the first popular machine-made joint in woodworking, and if you ever see it on an antique, it solidly dates that piece to any time between 1870-1900. Of course, now that you can just buy a CNC router, an infinite variety of joints are possible, and [Mirock] can experiment with all sorts of combinations of pins and tails and mortises and tenons.